Our RV travel trailer is practically a member of the family at this point, and even though we love it with all of our hearts, it has one major flaw … the grill. The RVQ, as it is sometimes called in jest, can basically ruin any meat or vegetable that comes in contact with its grates. We tried to make friends with our RVQ, but after suffering through two years of subpar camping dinners, enough was enough. It was time for a new grill, and Evanne Schmarder of the RV Cooking Show helped us find the right one for our family. Now we are paying it forward. With so many options out there, this can be an overwhelming purchase. Narrow down your search by first deciding if you want a charcoal, propane, or electric grill. Many people swear by charcoal, but consider that you might be using your grill much more on the road than at home. Want to toast those breakfast burritos in the morning? That will take a lot longer if you have to wait for the coals to get hot. Propane is by far the most popular choice with RVers since you can hook most grills right up to your camper gas line. They travel easily and cleanup is a snap. You can also use them in other situations, such as tailgating. Another interesting option is an electric grill. If you are planning to only stay in campgrounds with hook ups, this might be a very economical choice. Propane costs can add up, but electricity is included in the cost of a full hook-up campsite. Most RVs have outlets on the outside, so it’s a snap to plug in and prepare those fish tacos and shrimp kebabs. After you have decided what type of grill you want, think about portability. Look for a well-made, portable grill that can sit on a picnic table or one that has folding legs for easy storage. Make sure it fits in your particular RV, and don’t forget to check the weight. 1. How will I use this on the road? Will I use it most days, or just on special occasions? 2. What kind of campgrounds will I stay at? Do I boondock without hookups? Do I stay in state parks that might have fire restrictions in the summer? Do I always have access to electricity or propane? 3. What is the top end of my budget? Am I willing to spend a little more now to have a grill for years to come? So go ahead … get rid of the standard RV grill and find one that is worthy of all the amazing dinners you have in mind for this traveling season. Your fellow campers will thank you for it. 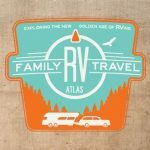 Jeremy and Stephanie Puglisi are the founders of the RV Family Travel Atlas podcast and blog. They spend over 40 nights a year in their RV traveling with their three young sons, sharing their experiences as they explore the new golden age of RVing.